Bold, compelling, uncompromising, intense, and one-of-a-kind were just a few of the phrases that leapt to mind as we sampled about 40% of Yusho’s menu last week — and all six of the house-made, draught cocktails pictured above. “Totally unlike anything the Strip has seen since China Poblano opened in 2010,” was the other. To say that we were impressed is an understatement. To say we weren’t expecting to be would be equally accurate. Turns out, Merges knew us and we knew Merges. Turns out. Matthias was one of the operatives behind Charlie Trotter’s Restaurant Charlie, when it opened way back in 2008. You remember Restaurant Charlie don’t you? 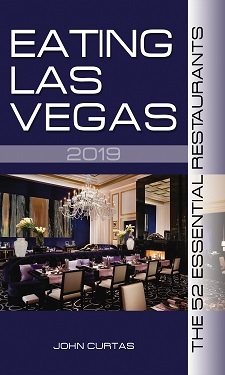 (For a brief two years, it had some of the finest food (and drinks, and desserts) Las Vegas has ever seen. Turns out Merges was one of Trotter’s honchos responsible for the quality-control, innovation, and drop-your-fork deliciousness that made Charlie so famous. Fourteen years with the owl-eyed one taught MM a thing or three — one of which is to pack a punch with what you serve, and don’t hold back on seasonings. Those who think modern cuisine (by which we mean “world cuisine” by which we mean “anything goes” cuisine) tends to be undersalted and tepid versions of food cooked better elsewhere, will have nothing to complain about. ….your palate will sit up and take notice. …to the crispy fried oyster (that could teach a number of chefs we know a thing or two about how to fry one) — but the menu is manageable enough (only about 25 items) to make its circumnavigation easy. Merges’ theory being: keep it simple and make everything simply excellent — another long overdue idea in a town swamped with mediocrity. Like the restaurant and Merges, it is sui generis, head-scratching and game-changing all at the same time. This is a significant restaurant. Ignore the unlikely (and inconvenient) location, and taste for yourself. And be prepared to drop your chopsticks in appreciation. ELV’s dinner for two (with a bevy of comped cocktails) came to $97 + $30 tip. Wow! I would go just to have Wolverine cook my meal!! But seriously, great to see an original breath of fresh air into the strip!! Not sushi, not pizza, not burger bar, not breastaurant, not gastro, not french bistro, and god no…not overpriced Mexican crap (Vegas over/under odds on Chayo BTW is 1 year). Japanese that isn’t sushi. Or a Benihana type place. And at Monte Carlo of all places. Wonder if it will last. So glad to see MM here in Vegas. A great and talented chef only overshadowed as a greater person. Went to eat soon as I heard he was in town, was NOT disappointed with anything. Nice to see a restaurant throwing down some serious flavor! I probably know Japanese food better than most white people named Ishikawa but the menu looks both strange and appealing to me. Will definitely check it out next trip to Vegas. I saw Bourdain on his new show eating a lot of stuff I would not eat at Raku but I look forward to eating there for the first time too. Anyone compare the two restaurants? The food is great. I ate there Wednesday evening and don’t forget to try the nori wrapped steak. awesome. Had been wanted to try and it and this post expedited the process. My meal was very good but this restaurant has no chance of survival. If it was in Chinatown and a 1/3rd of the price, it would be a hit. $24 for a bowl of ramen when Monta slings a comparable, albeit less intensive, bowl for $7? It’s a wide miss for the audience at Monte Carlo, not quite interesting enough to be a destination and overall too expensive. Such a shame.